(NBC News) – Three days after the 2018 election finds the two parties are still battling it out in several states. In Florida, Georgia and Arizona there’s a possibility of recounts. Governor and Senate seats are still undecided, and without presenting any evidence, President Trump is alleging voter fraud. 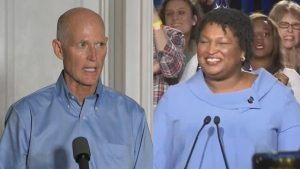 Florida Governor Rick Scott, who tried to declare victory in his Senate race Tuesday night, is now filing lawsuits against elections officials in two Florida counties, alleging their offices withheld voting records. “I’m really scared that Rick Scott, as governor of this state, is going to use his power to shut down votes,” said Connecticut’s Senator Chris Murphy. Florida’s governor race could be headed to a recount as well. Democrat Andrew Gillum is now within the margin to demand a recount in his race against Republican Ron DeSantis. In Georgia, gubernatorial Democratic candidate Stacey Abrams is still not backing down despite Republican Brian Kemp declaring himself the winner. Abrams needs 25,000 more votes to force a runoff, with absentee and provisional ballots still being counted. There’s also an explosive post-election fight in Arizona. Democratic Senate candidate Kyrsten Sinema now has a narrow lead over GOP opponent Martha McSally, but 400,000 votes are still to be counted there.